This dish epitomizes spring on a plate. This was the intention prior to making lamb belly for the first time; I knew the flavour combinations I wanted to incorporate, I just didn’t know how to execute it. To see the ingredients come together so harmoniously after the creative process of getting there from a relatively vague initial concept, is what makes me really love cooking. Sourcing the lamb belly may be a bit difficult at the run of the mill grocery stores, but if you go to any good butcher they will be able to help you out. If you go to an exceptionally good butcher, like Windsor Quality Meats, they will pull out a hanging lamb from the back and cut off the belly in front of your eyes. Game plan for the lamb, start 36-24 hours in advance. 48 hours lines up nicely for timing if you start the cure in the evening. 1. Mix the salt, sugar, rosemary, and lemon zest in a bowl. Sprinkle a layer in a baking dish, then set the lamb on top, then cover with the rest of the mixture. Firmly press the curing mixture into the lamb. Cover with plastic wrap and refrigerate for 24 hours. 2. 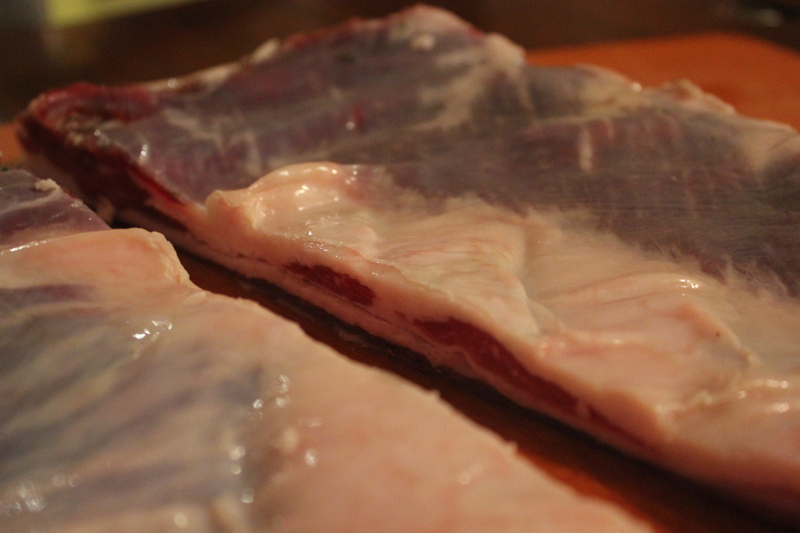 Thoroughly rinse the curing mixture off the lamb, then set on a cutting board and cut it in half into two broad strips. Do not season the lamb with any more salt, it will be perfectly seasoned at this point already. 3. 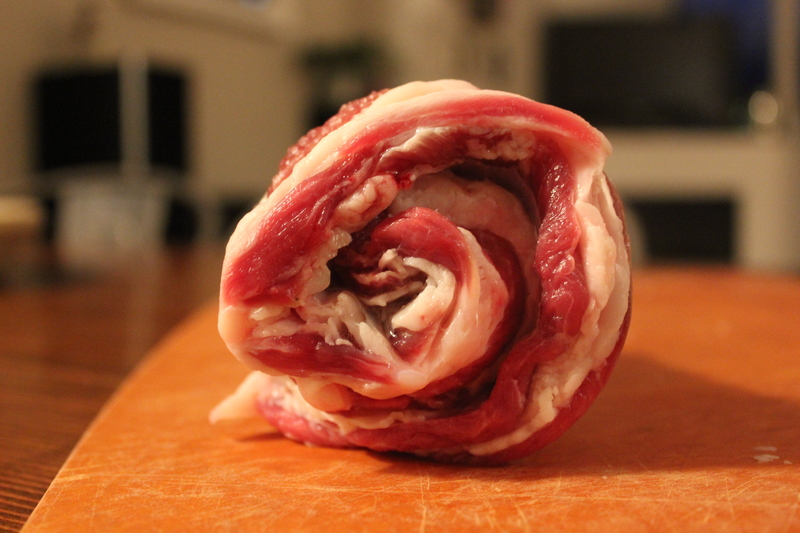 Roll up each strip of lamb belly like a jelly roll, press down to ensure it is packed tightly together, then tie with kitchen twine. You want the rolls to be as tight as possible with no air gaps. 4. Place each roll of lamb into a ziplock bag. Add a glug of olive oil to each, just to take the space of any small air pockets. Remove the air with the water pressure method, or vacuum seal if you have one. 5. Cook the lamb in a 70 degree water bath for 12 hours. 6. Remove the lamb and transfer to an ice bath the cease cooking. It is now ready for finishing, or you could hold it in the refrigerator until use. To finish, cut off 3/4 inch slices of the lamb belly, and sear in a very hot pan with a bit of oil until some nice colour and texture develops, about 3 minutes. Flip and repeat for the other side, then serve. 1. Combine all the ingredients except for the water in a food processor. Pulse until it turns into a fine puree. 2. Slowly add water and continue to puree until the mixture is about the same consistency as cream. 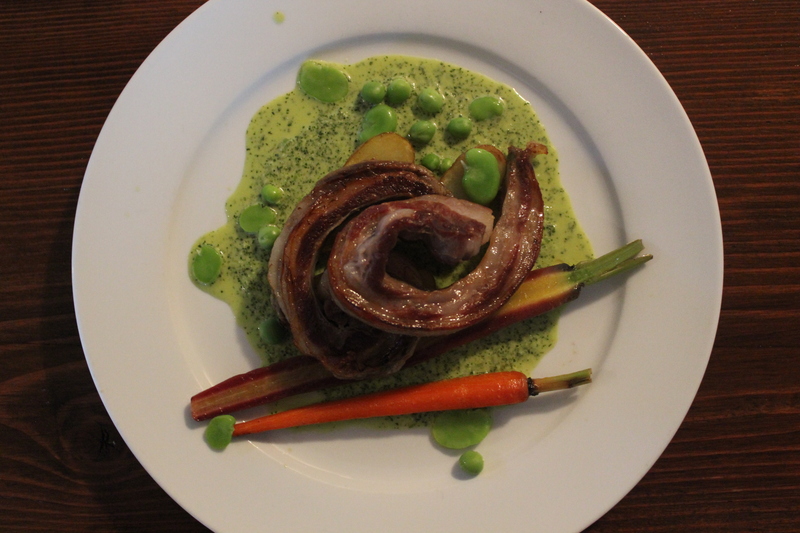 To plate, pour the mint and pea puree onto a white plate to make a pancake size circle. Top with a garnish of fresh spring vegetables. I chose simple parboiled potatoes and carrots, finished with a quick pan sear. As a finishing touch, I sprinkled with fresh peas and fava beans in order to really get the feel of spring on the plate. 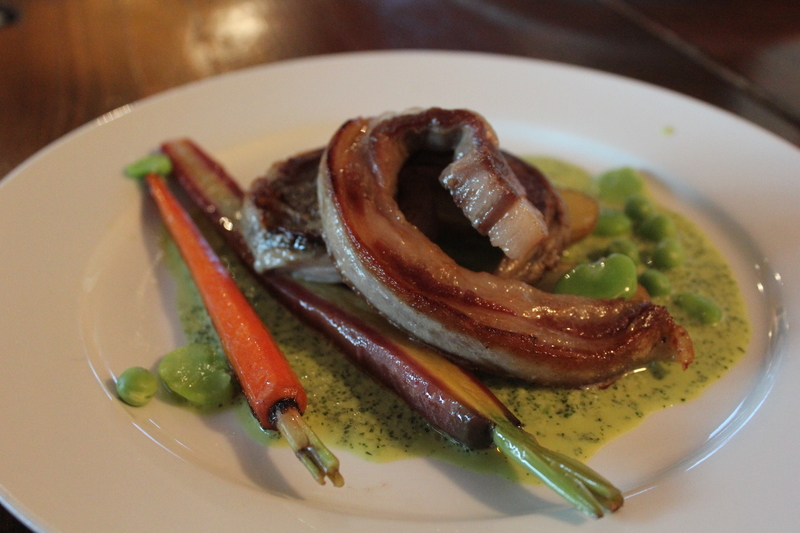 Top the vegetables of your choosing with the beautiful seared lamb belly and serve right away. Nice recipe, I like the curing method, the flavor combinations and the presentation. Lamb belly is known as lamb breast in these parts. I’ve cooked it sous-vide for 24 hours at 57 degrees and it came out perfectly tender and juicy. What was it like at 70? It was very tender (as you’d expect), had a pink hue, and also maintained a firmer texture. It wasn’t quite fall apart, but I wanted it to hold together a bit for this dish. The curing time and quantity was perfect for seasoning; I would not change the amount of salt or cure time when repeating. Lamb belly (or breast) was a great discovery. I have already talked to my butcher about getting more, I’m looking forward to experimenting around a bit with some lower temperatures.